The 15,000 square-foot center includes a 325-seat auditorium designed with lighting, sound stage and dressing rooms for performances and flexible seating arrangements for all occasions. Five conference rooms, a commercial kitchen, a dance studio and an exhibit space offer year-round opportunities. OACC is centrally located, has a convenient parking garage, very close to ample public transportation, and is easily BART accessible. Book now! A small stage, full wall mirror, dance barre and writing board make this studio ideal for dance, music and theater classes or rehearsals. A window with a view brings in light for airiness; acoustics are excellent. Event Rates 4 hours $150 8 hours $260 Additional Event hours $40each Additional Setup hours $40each Studio 6 (Tue – Fri, 10am – 5pm)* --- $35 Per Hour --- Non-Profit Rates 4 hours $120 8 hours $200 Additional Event hours $30each Additional Setup hours $30each Studio 6 (Tue – Fri, 10am – 5pm)* --- $25 Per Hour --- Please review our attachment for more options. Conference Room 2 is well-suited for small group meetings, music lessons and language arts classes. Airy with an overhead skylight and furnished with comfortable seating, the room can fit up to six tables to seat 24 people, 30 people theater-style and 20 people classroom-style. The room has a white writing board and its own storage closet. Conference Room 3 Identical to Conference Room 2 but without the skylight, this space can accommodate small meetings as well as class. Rental can include either tables (up to six tables to seat 24 people) or comfortable chairs to seat 30 people theater- style and 20 people classroom-style. The room has a white writing board and its own storage closet. Event Rates Conference 2 - 4 hours $300 Conference 2 - 8 hours $400 Conference 2 - Additional Event hours $60 each Conference 2 - Additional Setup hours $40 each Non-Profit Rates Conference 2 - 4 hours $200 Conference 2 - 8 hours $300 Conference 2 - Additional Event hours $45 each Conference 2 - Additional Setup hours $40 each Please review our attachment for more options. Conference Rooms 4 & 5 are large rooms which can be rented singularly or together. Separated from each other by a moveable partition, the two rooms combined can accommodate up to 130 people theater-style or 70 people classroom style. 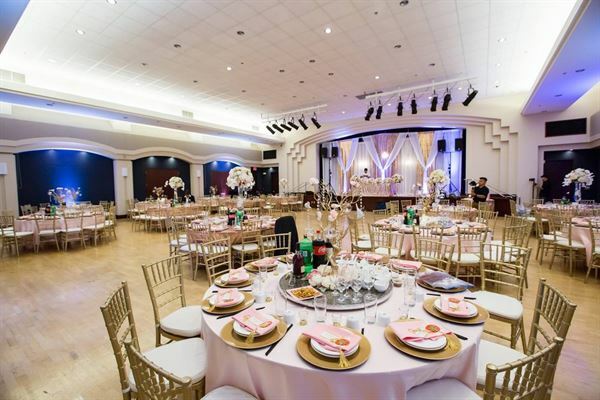 The large space is also ideal for receptions and social gatherings of up to 249 people. Both conference rooms are well-suited for large meetings or classes. Event Rates Conference 4 - 4 hours $450 Conference 4 - 8 hours $550 Conference 4 - Additional Event hours $75 each Conference 4 - Additional Setup hours $40 each Non-Profit Rates Conference 4 - 4 hours $360 Conference 4 - 8 hours $450 Conference 4 - Additional Event hours $65 each Conference 4 - Additional Setup hours $40 each Please review our attachment for more options. OACC is pleased to announce an exciting new rental program! Now you can rent the beautiful Edward W. Chin Auditorium for 30% off the published price, during weekday daytime hours 9 a.m. – 4 p.m. ** The Edward W. Chin Auditorium is a space that has dark wood paneling and contemporary details that create an ambience of elegance. Cathedral ceilings that reach a height of 16 feet allow for excellent acoustics. Completed with a generous donation from Edward and Yuri Chin, the auditorium is equipped with modern sound and lighting systems. It also has a stage with curtains and front house lighting. Theater-style seating can accommodate an audience up to 325 people while banquets can seat up to 220 guests. A large stage, hardwood floors, dressing rooms, and audio-video capacity make the Edward W. Chin auditorium adaptable to a variety of uses- from theater and music performances to banquets, receptions and major conferences. Event Rates 4 hours $1100 8 hours $1650 Additional Event Hours $200 each Additional Setup Hours $100 each Non-Profit Rates 4 hours $900 8 hours $1350 Additional Event Hours $160 each Additional Setup Hours $80 each Please review our attachment for more options.